Grab your leather working tools and get started making yourself some great new leather items you'll be proud to carry! Well-crafted leather pieces are always in vogue. And minimalist modern styles are easy to make following the step-by-step instructions and templates provided in Making Leather Bags, Wallets, and Cases. 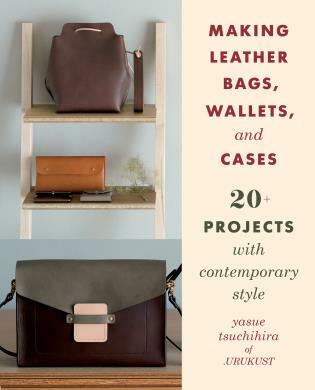 From statement handbags to chic wallets, eyeglass cases, portfolios, and more, this book includes projects even a novice leather worker can make but that look so high-end people will be astonished if you tell them you made it yourself. Yasue Tsuchihira began crafting with leather at the age of 13. She studied design at Kuwasawa Design School and thereafter began her career as an apparel designer. In 2011 Yasue founded the leather accessories brand and studio .URUKUST. Her simple elegant designs are made with leather that is locally sourced and tanned. She is an adjunct instructor at Joshibi University of Art and Design, and also teaches leather craft workshops and classes. To learn more visit www.urukust.com.